31 people like this product, you too? Housing and wheels of the twin wheel castor are made out of high-quality plastic; the wheel covers are high grade chromium-plated. Due to its clearly defined and reduced to the essentials design and its low construction height, the extraordinary twin-wheel castor harmonises ideal with contemporary furniture design. The extremely broad, hard running surfaces optimise its running properties, protect the floor surface from running grooves and pressure marks and provide optimum movability on all soft/robust floor surfaces. A brake fixes the furniture securely and safely at the desired location. Particularly comfortable: an extra broad, serrated foot pedal allows the quick and safe locking of the brake without the need to bend down. The attachment solution is ingeniously straight-forward: The castor comes with a standardised mount of 8 mm. This mount fits all furniture castor attachments in the Wagner Norm System. They also have a standard size of 8 mm. 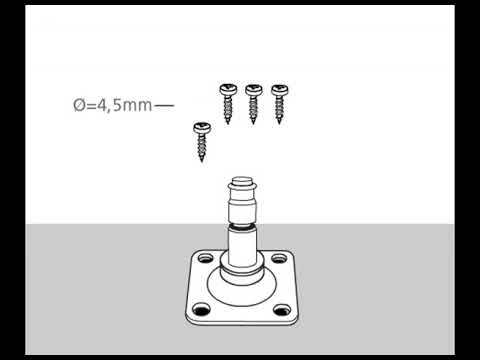 This is how it works: The upper part of the attachment makes the connection to the item of furniture. The lower part of the attachment makes the standardised connection to the castor. Plug together - and you are done! Result: Any castor fits any attachment - and therefore every furniture type.